Personal performance coaching sessions every Saturday morning (8-10am) in Welwyn Garden City (Stanborough Park). Please bring along your own equipment (skis, boots and poles). No equipment is available for hire. Rollerskiing is excellent practice for on-snow Cross-country Skiing, and is also an effective way of keeping fit in its own right. In either the Skating or Classic technique, Rollerskiing can take place anywhere with suitable tarmac, although instruction is provided on tracks and cycleways. 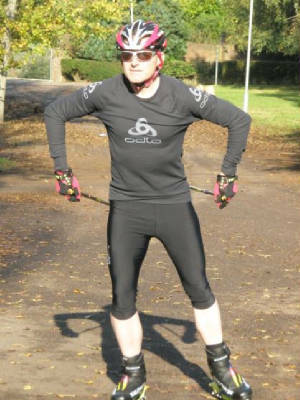 Heathley provides free performance coaching for beginners new to Rollerskiing, and to skiers looking for those extra areas of coaching at the elite and racer level. Aspirational and existing instructors also learn with Heathley, as his technical and teaching skills are at the highest international level, ensuring comprehensive and up-to-date techniques are communicated. Contact Heathley to notify of your intention to join a personal performance coaching session at Welwyn Garden City (Stanborough Park). Please bring your own rollerskis, boots, poles and helmet. Skate 3 - for cruising!